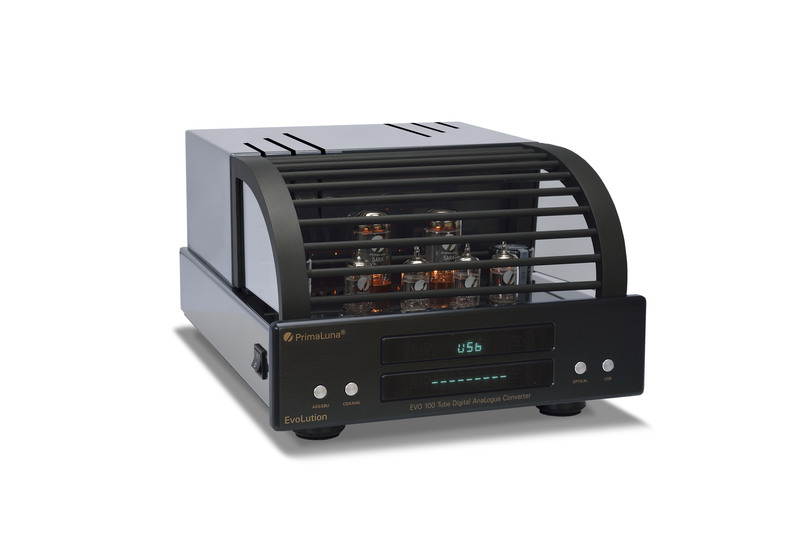 And the PrimaLuna DiaLogue Premium Integrated Amplifier is the first from the PrimaLuna family which has our 100% approval to use the new KT120 power tubes. We have users in the field reporting about favorable results with these tubes in other PrimaLuna models, but we did not actually prepare any of these models for this tube. The power section for the PrimaLuna DiaLogue Premium Integrated Amplifier has been prepared for KT120. The amplifier bias switch position for KT88 and KT120 is the same. Since many years we are using again a Russian tube in our PrimaLuna products. We used Sovtek 5AR4 in the beginning for our ProLogue Three preamplifier and ProLogue Eight cd player and Electro Harmonix AU12AX7 in these same PrimaLuna models. As these Russian tubes were too “fragile” we switched to Chinese tubes and found these to be more reliable in the long term. After we receive the tubes from the manufacturer (who quality-controlled them to be within his specs), these tubes are re-selected by us following our simple 60 out of 100 rule (PTS™ – Premium Tube Selection).The best 60 pieces get the PrimaLuna label, the rest goes back to the manufacturer and are sold elsewhere. These 40 are good, but not the best. While matched tubes are not a requirement, it is still recommended if you want to get the very best results. If you want to go N.O.S. (which we cannot due to the limited availability), several other parties offer these, if you wish to upgrade. KT120 tubes are bought by us as matched Quads and after we receive the tubes we re-test them to be sure nothing went wrong in transport or during the matching process. If specs are met, a PrimaLuna label is added. Thank you very much for the honest information. I have checked the KT 120 for some hours in my Dialogue One and I liked very much, but I read somewhere that Kevin doesn’t recomend it and I gave up. There is any chance that the Primaluna Dealer be able to operate the adaptation of power section ? Kevin is correct. Only the DiaLogue Premium Integrated which will become available end of May has a powersupply specially prepared for KT120 too. A modification would be expensive due to most expensive part (transformer) which is heavy (transport) and time-consuming. Are the optional KT120 tubes from China as well? Not that I mind, but I thought I’ve read somewhere that only Tung-Sol (from Russia I believe) was making KT120 so far. A pair of Tung-Sol KT120 goes around 90$US, should we expect about the same for that option on the DiaLogue? No, not from China. We will use the Tung-sol KT120. Will try to keep these under US $ 70,- as we see tubes not as a margin product. We try to keep the hobby that way a little more affordable. Will the mystere amps get a approval for using the kt120 tubes as well? Yes, you can use KT120 tubes. greetings: after reading the above posts, i am a bit confused as to whether i should try some tung sol KT-120s in my prologue two. please clarify. Hi André! (your) problem is that you have to read the messages in order of time. Initially we did not approve KT120 as we had not experienced it. Later on we have experienced for long enough time, that KT120’s behaved well and also the amps used in it could handle them without problems. So the final verdict is that all PrimaLuna and Mystère models can use KT120 tubes without problem. My dealer in Switzerland advise against the use of kt120 tubes beauce kt120’s need more power. So I am confused because the last thing I would like to do is to destroy my Prologue Cassic amp. Instead, he offers me the new realeased?? 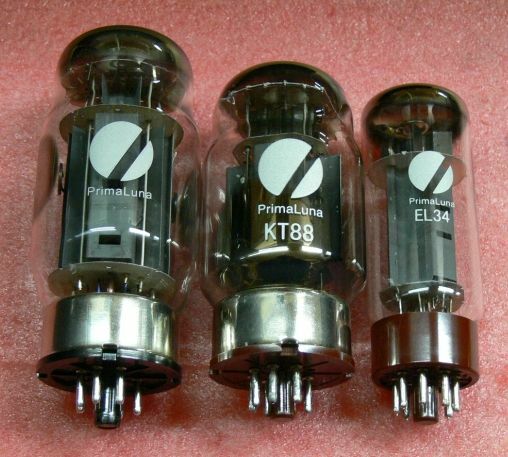 PrimaLuna kt88 tubes which have more power? Is it true, that PrimaLuna released new kt88 tubes? P.S. Did you ever listen to Pink Floyd’s Dark side of the moon album with PrimaLuna amp. and Magnepan 1.7 loudspeakers? Ik ging helemaal uit m’n dak! 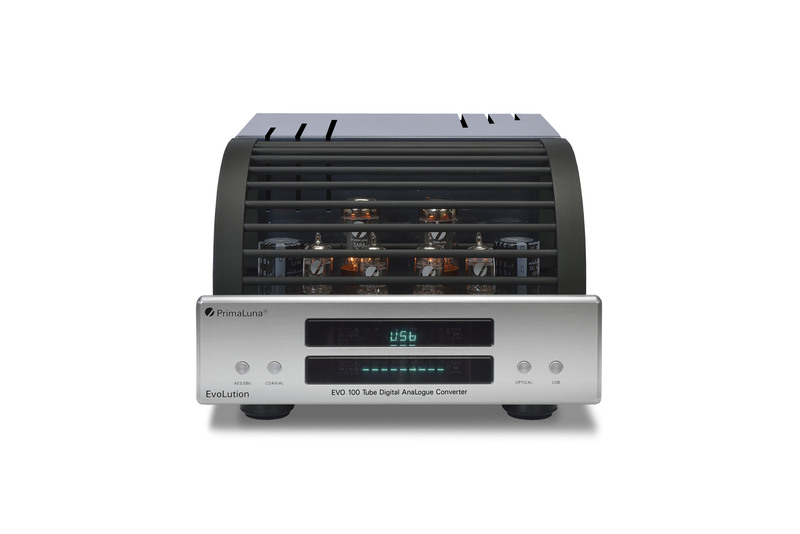 The amplifier was not specific designed for KT120. Once the KT120 came on the market we said no, just to be sure. After several comments from people who tried anyway and reported about the superior sound, we decided to do a 6 months day-and-night test with KT120’s in both several PrimaLuna and Mystère models. We found not one problem, so we decided to say YES instead of no. And since then only positive comments. So, your dealer may refer to the period BEFORE we said YES. We have next to the standard Silver label KT88 tubes, also now Gold label KT88 tubes. These tubes are the same as the Silver label, but we have matched these in quads. This makes life of the Adaptive Auto Bias circuit a bit more relaxed. Not that this is necessary, but it never hurts. The matching was mainly done for other brand amplifiers without Adaptive Auto Bias circuit. I have heard PF DSOTMoon in many systems and it is “my music”, but don’t know if I ever heard it on Magnepan to be honest. Because I am new in the ‘tube field’, I’d better ask before making a wrong choice. At this moment the Gold label PrimaLuna tubes are not everywhere available and I am still looking for a good address. PrimaLuna is my first tube amp, and for me it is really magic; the looks and especially the sound is breathtaking. I will make up my mind thanks to your help. Yes the 120’s fit and are reported as a very good upgrade! No personal experience with cryo, but heard also never a bad thing about it. It does take stress out of materials. Thanks for your post. Wished I could help you from here, but this is typical local dealer work. It is really impossible to say if this will work as you wishes or not. I hope it will of course. Let us know. I will give your compliments for the articles to Dominique, who is responsable to get these blogs feeded. As seems to the be the national trend, EVERY single Hi-Fi store in Spokane has closed their doors., and we are left with a teeming throng of Walmart and Best Buy junior managers, languidly standing by for all of our sonic needs. Although the “Audio Specialist” at these fine stores do not comprehend the concept of a “standing wave”, they completely understand the concept of “standing around”. Never satisfied resting on past laurels, these young men, on a moments notice, are able to stroll down the aisle and sell garden hoses (in both large and small sizes)), glitzy ladies handbags., and B-stock Microwaves. An amazing example of our versatile youth in action. And their haircuts are technological wonders. I like your humor about a thing we both consider being sad. Modern times … 😦 are not always easy. I upgraded to the Tung Sol K120 tubes for my virgin PL Dialogue Integrated amp. Now I am worried that I gave up some crucial power compared to the KT88’s. I need every available watt I can mamage to throw into my Martin Logan EM-ESL’s (20-200 watts recommended) as it seems they are only 91db efficient . Is the power difference negligible, or have I dealt myself a serious audio blow? Normally you should be able to get some more power with the KT120 tubes. I’m a glad owner of a primaluna prologue Classic el34 integrated amp. I’ve tried to run tungsol kt120, but The led on The display turned red. Is a tube failure or my amp is not built to work with those tubes? Should be able to work with KT120. We do it often. Hi Herman- Okay, your yellow life-raft just sprung a leak and is sinking, and you can only grab a single set of vacuum tubes for your Tropical Island Hide-Away which holds your Prima Luna Dialogue Premium Integrated Amp & Prologue Classic CD player (driving Martin Logan EM-ESL Electrostatic/cone woofer hybrids) Which kind of tubes would you grab & swim to shore with? And yes, no one is looking, you can do the doggy-paddle…..
PrimaLuna tubes: 12AU7’s, 12AX7’s, 5AR4’s (brown socket), KT120. Good sound. Good reliability. But maybe too humid there for electrostatics? KT 120 is not a problem. In the DiaLogue Premium serie you can use the KT 150 tubes! Please send an email to service@durob.nl and we wil asnwer your questions. Thank you and best regards!